Dear BIR Commissioner: Doctors are Noble and Not "Cheats"
The Philippine Medical Association headed by Dr. Leo Olarte, voiced out the sentiments of the physicians that the said AD generalized all doctors as tax cheats. 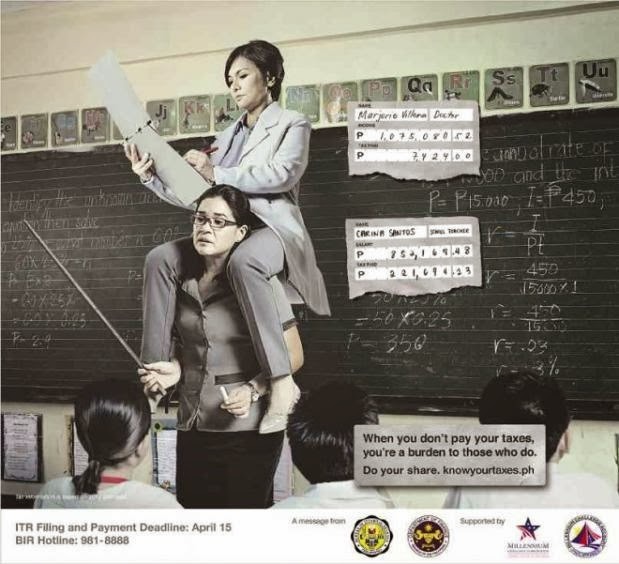 The PMA asked the BIR to take down tha offending AD but Commissioner Kim Henares said that AD in question was not offending or insulting since the print AD was a statement of fact. Yes. There are doctors who do not pay the correct taxes but there are other professionals who do not pay the correct taxes too. Heck! I guess most politician and their cohorts do not pay the correct taxes! Why not go after these people? Why not go after those who "fix" their taxes c/o legitimate BIR representatives? The print ad was in bad taste. Disrespectful. Offending. Insulting. Demeaning. What was Kim Henares thinking? Henares forgot to consider the nobleness of the medical profession. True. There are doctors who are filthy rich because of their practice as there are doctors who barely make ends meet because they have dedicated their life in "really" helping those who need their services. It does not follow that those rich doctors and "poor" doctors are tax cheats! A survey of the best paying job indicated that doctors ranked only 5th. I know a particular doctor who does pro bono surgeries on a weekly basis. He said that due to the BIR ruling, he now has to charge his charity patients 100PHP instead of them presenting an affidavit of free medical services.Why? An affidavit costs at least 300 PHP therefore it's cheaper (for the patient) to just pay 100 PHP professional fee. In connection, a brief demonstration was led by Alliance of Concerned Teachers (ACT) and Gabriela on Friday, March 6. Shoulder to shoulder, teachers and doctors condemned the BIR AD that portrays doctors as tax evaders. The protesting group challenged the BIR to go after conglomerates and business tycoons instead of doctors (and other professionals). Kim Henares. What gives? Why are you so fixated with doctors?